the first of November. 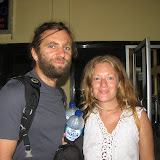 We want to get to Langkawi on the border between Malaysia and Thailand as soon as we can to get some boat work done. So on we march. not be seeing the ocean for quite some time, so they’ll have to live on those memories. spend a few days in Singapore, and then start the Malaysian and Thailand adventures. Before leaving here, however, we plan to snorkel the day away. This place is amazing. We had absolutely no idea what it was going to be like and we were delightfully surprised. There are rounded gray and white boulders piled on top of one another on one side of the anchorage and people who have been to the British Virgin Isles say it is just a mini-version of there. The snorkeling is evidently good among the rocks and the water is crystal clear. The beaches are white sand and the people of the island have gone all out to make cruisers feel welcome. We have heard from some cruisers that a million people live on this island. I have absolutely no idea if that is true, but those that were here on the weekend say that 30,000 locals came to the beach to greet cruisers and to enjoy the day. That’s an amazing number of people to come to this beach, but there are a number of shanty-type restaurants lining the shore to accommodate the weekend crowds. We are told the food is great. So good snorkeling, clear water, white sand beaches, beautiful scenery, great food, and cheap Bintang (beer)-what more could one ask for? The answer to that would be a calm anchorage, which evidently this one has been except for a few hours every afternoon. But since we arrived it has ramped up a notch and getting on and off the dinghy is a dicey affair and coming back to the boat from shore is a wet affair. I guess you can’t have everything. But I must add that the people here have vans waiting onshore to take us wherever we want to go and they refuse to charge us. 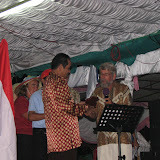 Everyone has been giving the driver 50,000 Rupiah which is about $5.00US, but it is a donation. Unbelievable. We arrived at 10 am this morning and had planned to spend a quiet day on the boat. We always plan that, but it never happens. No sooner had we arrived than we heard that there was a 12 noon trip to a nearby village. So off we went. The village was about 30 minutes away and it was called Balitung, instead of Belitung. 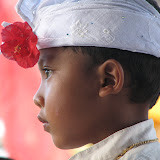 It is Balitung because the people originally came from Bali. I can’t wait to get to the internet to find out why there are people from Bali here and who the other people here came from. But until then, we’ll just keep enjoying the place. The village was just like being back in Bali. Every home along the road had a little shrine out front. We went to the real temple and loads of people were there to greet us. They were dressed in their Hindu best and were so gracious. They seated us under a roofed area just outside the temple and then the show began. Women were constantly carrying offerings to the temple while all of the elementary and middle school-aged children performed beautiful Balinese dances for us accompanied by gamelan music. The young women dance, then the young men danced, then the players in ornately decorated animal costumes with fantastic masks performed. After the dances, we went into the temple to see all of the offerings that had been brought in today and to mingle with the people. All too soon it was time to head back to beach. It was late afternoon when we returned and Mark was able to complete the check-out procedure for Indonesia. We then came back to Windbird to write and send this log and to turn on the anchor lights and then return to shore. There is a special Full Moon Festival tonight and we don’t want to miss that. And there are special performances planned for all day tomorrow and a farewell dinner tomorrow night. We had planned to leave the next day, but I think we will stay here for an extra day or two to snorkel and just enjoy the people. We made reservations today for a marina in Singapore for next Tuesday, so one way or another we will be in Singapore by then. We are anxiously awaiting word that Justin and Jo have made it home safely, but that won’t be until our tomorrow morning. So I’ll have to report on that in tomorrow’s log. the main out to starboard. I will keep the motor going until he gets up and we can really adjust sails. When one person is asleep, the other is never to go out on deck and deal with sails alone. I cheated and went out to change the vang over, but I had on my inflatable and held on tight. The seas are totally flat, so I didn’t feel like I was taking much of a risk. boats out on the shoal we were passing. There were also loads of fishing vessels in our path and tugs pulling unlit barges, but the tugs do follow the light configuration demanded by international marine law. At least the ones we have seen so far do and for that we are thankful. We spent part of the day looking forward to the next three months of sailing in Malaysia and Thailand. We are working out a rough schedule that we will continue to modify but we do now know that we plan to arrive in Singapore next Tuesday. 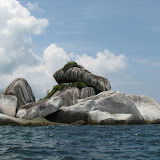 When we reach Belitung and phone service, we will try to call Singapore marinas to make a reservation. It is cheaper if you reserve for ten days, so we will probably stay that long and then head up to the Malaysian coast to Langkawi. in Kalimantan will certainly be the orangutans. 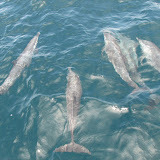 Getting to know them was a highlight of our voyage to date. little break before we start the trek up the Malaysian coast to Langkawi. we will have more storms tonight. As we were eating dinner in the cockpit, a small land bird came to visit us. We are still fairly close to the Borneo coast, but when land birds try to perch on your boat, it usually means they are exhausted from fighting strong winds. I’ll be happy is this doesn’t prove to be true this time. I’m having a tough time adjusting to life without Justin and Jo. Cruising is wonderful, but it is so hard to be so far away from family. Having them here was so special, but it will take a few days for me to adjust. In the meantime, we’ve got this yucky weather to keep us focused. I’m hoping for sunshine tomorrow.